Th P10 manual shows a graph for airflow through the vent at a given pressure. All the masks I've ever used have a similar chart. I'm not sure how some machines calculate "leak rate", is it a value that's above the normal flow rate line and then it reports the difference? Somewhere in this thread, there was mention of a check-valve inside that mask. I don't know of a mask that has one of those. Nasal pillows may have a 2-layer seal - a cone within a cone - that you have to make sure isn't out of shape. If the inner seal gets inverted, it can pinch off airflow. But that airflow is still downstream from the vents. The P10 manual also says that the figures in the graph and table are approximate and subject to a number of influences. Nobody outside of Resmed seems to be entirely sure how Resmed's estimate of leak rate is arrived at. The earlier mention of checkvalves in the P10 was that there was not one in that mask. - "unlikely as it would be effecting so many people all over the world"
- "the RESMED S9 will not let the pressure drop below 4"
- "the combination of low pressures and EPR should be avoided"
Not sure where this leaves the debate? During that period I was ever, ever, so debilitated, while, for sure acclimatisation was a major factor, I find it hard to believe it was the only factor? I am continuing to acclimatise well to CPAP and in particular the F20 mask and have been cleared to go back to work. Each fine tune on settings is a step ahead and I am now in charge of my own settings! As I am a nose-breather, down the track I would like to give a nasal mask a go again. It is so less obtrusive than the full face. Also the P10 exhaust is very quiet. 1) There was data on the back-pressure from the P10 vents so the maths can be done. 2) The was an elbow in front of the P10 mask to turn the tube down rather than rely on the flexibility of the hose. 3) There was a non-return (stop) valve in that elbow. The data on the P10 back pressure is readily available. It is the therapeutic pressure provided by the CPAP. If you want a higher sampling rate, look at the mask pressure which has the same sampling rate as the flow rate. Back some time ago, I developed the same type of concern regarding a different mask that had a diffuser on the vent. I could barely move air through the vent even with a brand new diffuser. I quit using that mask and felt better immediately. As I have said before, I think that people vary in their sensitivity to CO2 levels so what may work for most may not work as well for an individual. I think your doctor's comment regarding the affect on people worldwide was shortsighted. I am currently using FFMs that have plenty of venting and I feel a lot better for it. Extrapolating further on Payton's comment I experience frequent CO2 regurgitation with the Dreamwear mask. Not really sure why - it could be the cushion vent system or the vent holes in the elbow where the mask meets the tube which could get obstructed by my pillow. When I switch back to the P10s I don't get the CO2 headaches. My leak rate is higher on the P10s than the Dreamwear but still well within therapeutic tolerances. Therefore, I tolerate some higher leaks for less CO2 problems. YMMV. INFORMATION ON APNEA BOARD FORUMS OR ON APNEABOARD.COM SHOULD NOT BE CONSIDERED AS MEDICAL ADVICE. ALWAYS SEEK THE ADVICE OF A PHYSICIAN BEFORE SEEKING TREATMENT FOR MEDICAL CONDITIONS, INCLUDING SLEEP APNEA. Someone might consider a F&P Brevida if they're worried about CO2 buildup. All masks that I use, except this one, show a 0L/min baseline leak in SleepyHead. The Brevida shows a baseline of 4L/min leak @13(ish)cm. Additionally it comes with a removable leak restricter if you desire a higher leak rate or using the mask at higher pressures. For clarity sake, it was not a Dreamwear mask. It was a F&P Zest Q nasal mask. Thanks for the clarification Payton. The entire discussion on CO2 has been very interesting and illuminating to say the least. When all else fails read the manual... amazingly I still had mine. Image below is from the P10 user manual. This info relates to one off events like power or machine failures. I feel like I must be missing something. That short paragraph demonstrates just how serious CO2 is, death, and yet there is no safety measures in place for something as common place as a power failure... really??. I think long term low level poisoning is even more important because it’s hidden and long term. No one can definitively say how much CO2 they are rebreathing. There is nothing good about rebreathing even small amounts of CO2 for hours on end. We need to know. The pressure flow graph in the manual clearly demonstrates the frictional relationship between flow rate and increase in pressure. I have found out that the ResMed S9 has a flow rate meter and a pressure meter so the data it reports may be quite accurate. I think it could definitely provide useful consistent data even if its not accurate. I have no way of testing the accuracy of their flow rates let alone my own. This is really important. If anyone can figure out a way with a ResMed S9 I’d love to see it. All the flow rate tests I have made give the base flow rate as 0 on all graphs. All we need to find out is ‘at a given pressure what is the rate of flow through the vent’ if it is the only outlet. I have read through this thread with great interest. I especially appreciate the persistent input from Hulk and the very thoughtful and detailed additions from DaveResmed P10. 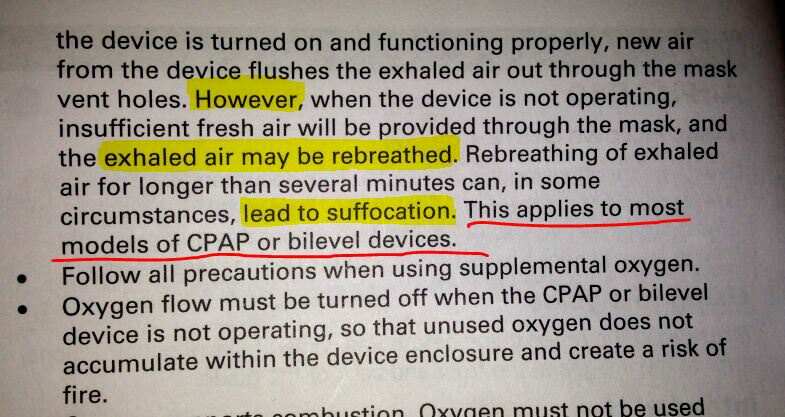 There were all these dismissive disputes about whether this could ever even happen in a hi tech, FDA approved device as well as the use of leak rates to try and prove its not happening. At that time I felt that the definitive way to resolve this issue was to measure the real-time PCO2 in the P10 tubing. I obtained a highly sensitive CO2 sensor in 2016 to permit this but the supporting software was defective and after a prolonged wait for this to be addressed I finally gave up and moved on to other things. But now that I have the means to measure the CO2 I have recorded a number of capnographs that show the precipitous rise in CO2 that can occur within the P10. One graph shows a sustained elevation to over 45,000 PPM (4.5 %) for over 35 minutes before I woke feeling very uncomfortable. I endured the discomfort and breathed more forcefully, which finally opened the vent and brought the PCO2 back down. I also have very high powered pictures that show the characteristics of the webbed vents and factors that probably contribute to the risk of vent occlusion and resultant hypercapnea. I intend to post this data but I am not sure where to do this because there are a number of threads like the one I started, this one and the very extensive 24 page thread. Any input regarding where to post this would be appreciated.